Fronius has been looking forward and producing innovative new ideas for years, continuing to learn and grow as the demand for natural power sources increase. As the demand for natural power increases so must the quality of the products that meet this demand. Fronius products have risen to that challenge and use only the most advanced technologies in their products to make using natural energy possible for those who live green lives all over the world. These products also continue to improve, as the technology industry is notorious for continual advancement. The biggest part of efficiently harnessing solar energy is the inverters that make it so. 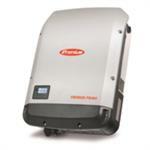 These inverters have been an exclusive part of the Fronius line-up for several years. To put it simply, inverters are used to change the wave length at which photovoltaic cells provided by solar panels operate into a sustainable energy source. That energy can also be transferred to internet or communication systems where the performance of the solar panel and inverter can be monitored by the consumer themselves. Fronius technology has been named as one of the most advanced in the industry, earning several awards and certifications for their forward-thinking and technology innovation. What makes Fronius inverters so appealing in comparison to their competitors is their intuitive operation and use of sophisticated self-diagnostic operating system. In the world of inverters, health of the product is extremely important, that is why it’s so impressive that Fronius products posses a self-diagnostic system. The types of inverters that Fronius has available are both compact and regular in voltage and size. The larger inverters are capable of a maximum of 4000 watts of total power, 500 volts of DC output power, and 150-450 volts of operating DC voltage range. The advantages of a larger inverter include: higher yield during partial load conditions, significantly reduced operating hours, and two power stages in a single device. The smaller options don’t produce as much power but still have all the advantages that Fronius technology builds into their products. All inverters also posses a LCD screen that makes monitoring the product user-friendly. Fronius solar inverters have been proven to provide up to 96% maximum efficiency, providing more power for the user while cutting down on environmental damage. The environment has several natural sources to provide power, Fronius has studied and observed this simple fact and provided products like solar inverters that help consumers without hurting nature.